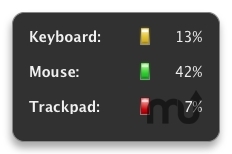 Dashboard widget that displays battery level of wireless input devices. Is there a better alternative to BatteryLevel? Is BatteryLevel really the best app in Applications category? Will BatteryLevel work good on macOS 10.13.4? The level indicators turn yellow below 30% and red below 20% remaining battery. If your Apple input device is not supported, please contact me.